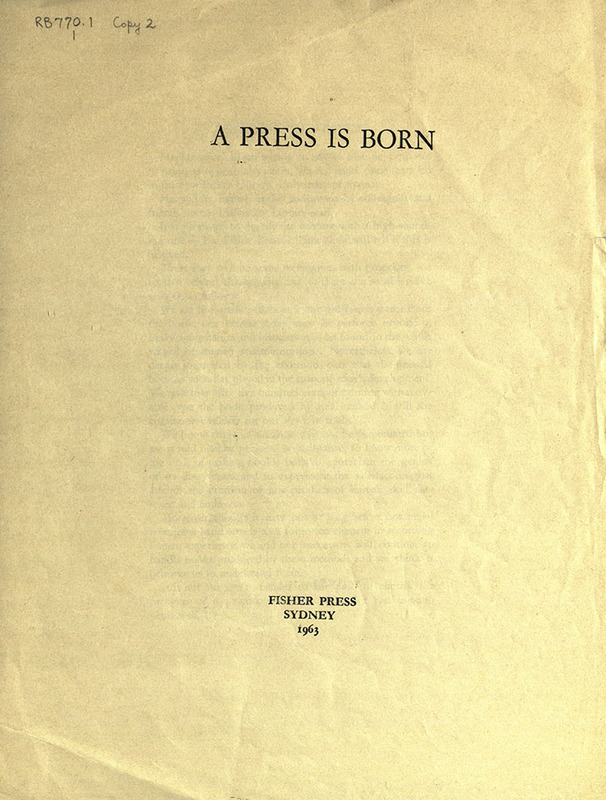 A press is born : a statement of intent. Sydney: Fisher Press, 1963. RB 770.1 1 copy 2. 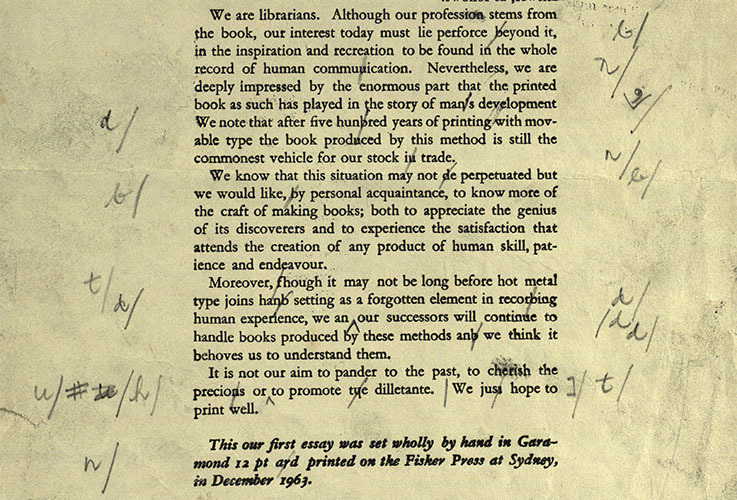 Produced in December 1963, this leaflet announces the establishment of the Fisher Press within the University of Sydney Library, and is the press's first official publication. 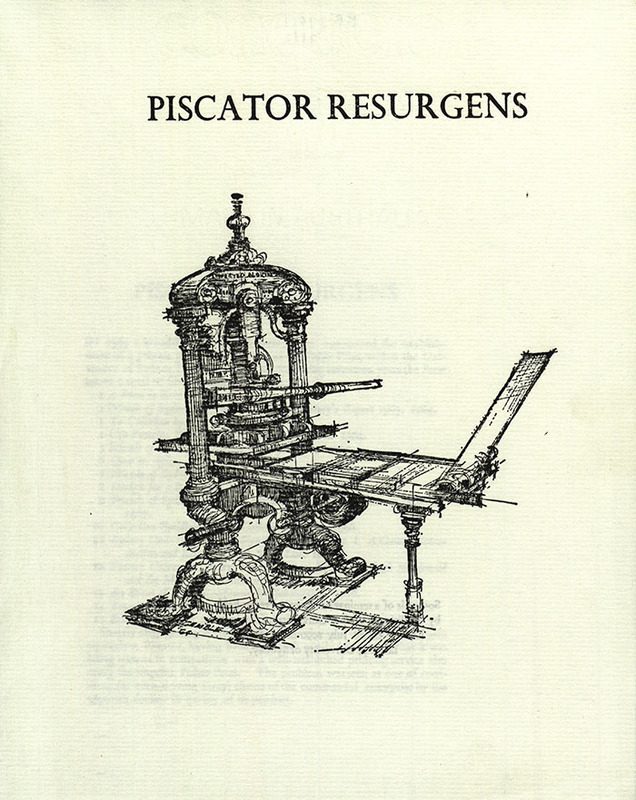 The following year, the name of the press was changed to its Latin equivalent, Piscator, due to the name ‘Fisher Press’ already being in use by an established commercial printing service. Australian Book Review, August 1965, p. 1. RB 770.1 13. 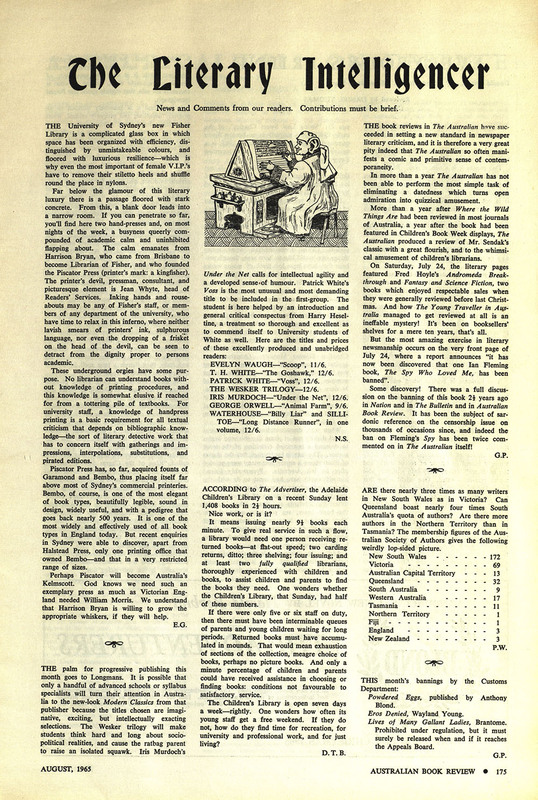 In this letter published in the August 1965 issue of the Australian Book Review, 'E.G' provides a most intriguing description of the fledgling Piscator Press. 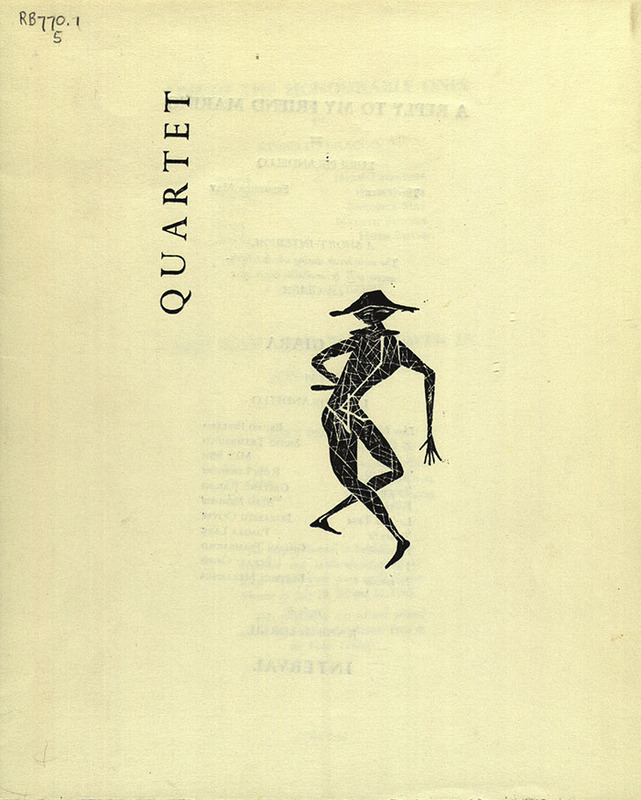 Quartet : programme of Italian plays presented in the Union Theatre, University of Sydney, July 29, 30, and 31, 1965. Sydney: Piscator Press, 1965. RB 770.1 5. The sixth official publication of the Piscator Press, this program was produced for a fundraising performance staged to support the purchase of Italian books for Fisher Library. The fonts of Bembo and Perpetua, from which this program was set, were made available to the Press by the Department of Italian. Souvenir of a print-in at the Fisher Library. Sydney : at the Piscator Press, 1976. RB 770.1 16. This leaflet was produced to commemorate a lecture and ‘print-in’ for Friends of the University of Sydney Library, held on Tuesday 24th August 1976. Designed and set by Library staff, attendees of the event struck off their own copies. 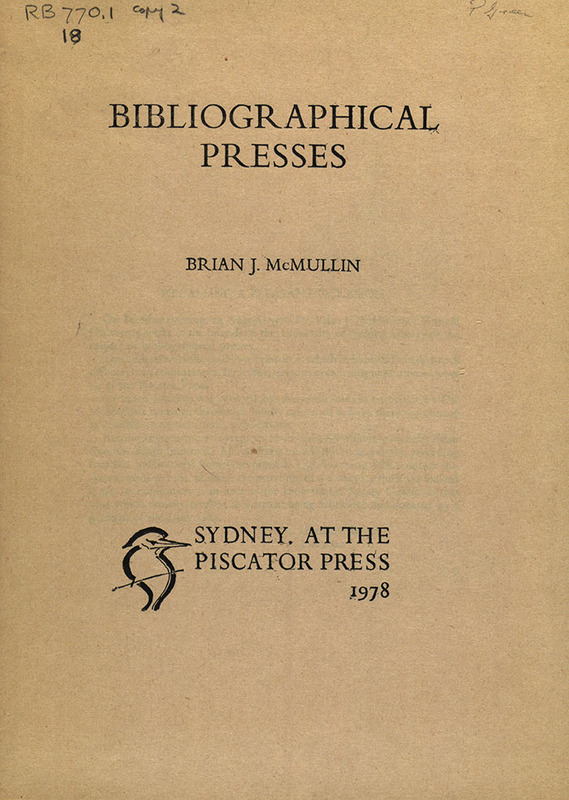 Bibliographical presses / Brian J. McMullin. Sydney : University of Sydney Library, Piscator Press, 1978. RB 770.1 18. This publication presents the lecture component of the address and print-in event held on Tuesday 24th August 1976. It contains the text of the lecture given by Dr Brian J. McMullin of Monash University, as well as a reproduction of a drawing of the Piscator’s Improved Albion by Allan Gamble (also the designer of the press’ kingfisher logo). Sydney : Piscator Press, 1990. RB 770.1 21. The Piscator Press ceased operations in 1980 with the departure of its founder, Harrison Bryan, to take up a position at the National Library of Australia. 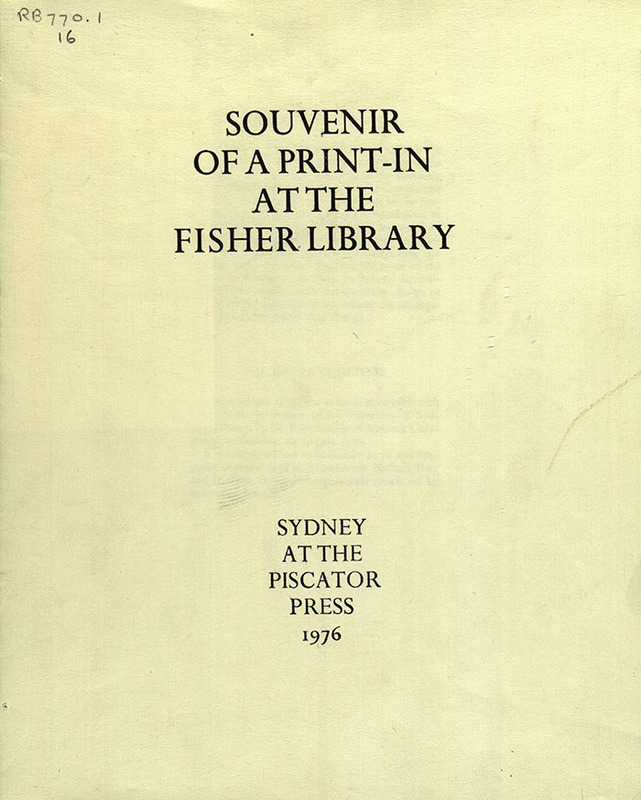 This leaflet was produced with assistance from the now retired Harrison Bryan as a souvenir of a seminar on private presses, held by the Friends of the University of Sydney Library on 28 July 1990. It marked the end of a ten year hiatus, and the beginning of a second series of cccasional publications. As well as a bibliography of the Piscator Press’ fifteen publications to date, this leaflet includes a reproduction of Allan Gamble’s sketch of Fisher Library’s Improved Albion, as did the last publication to emerge from the press, twelve years earlier.